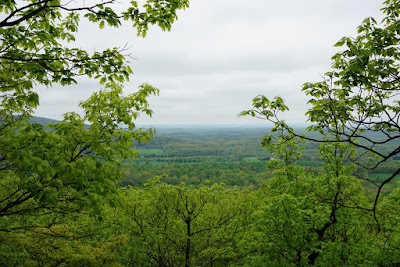 The weather was damp and I chose this hike which is relatively short and has my car in the middle so I can bail out in the event of rain. 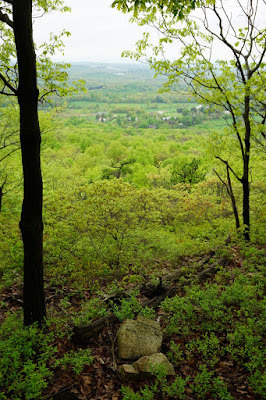 In the end, the rain held off for the entire hike. The rainy weather also afforded me the oppurtunity to visit this place, since the parking is so limited, it takes an event such as poor weather to be able to park your car on a weekend outside the winter. There is no other place to park in this area. 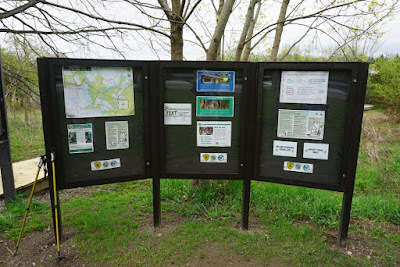 If the 8 designated spots are already taken, there is no where else to park and you are forced to change your itinerary. 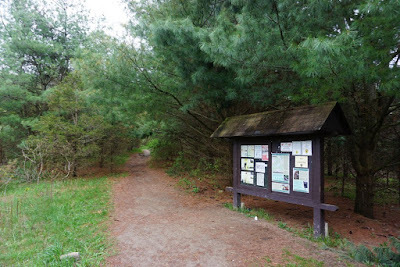 I parked in one of the designated parking spots on Indian Brook Road and walked down Warren Landing Road to the Nature Center. 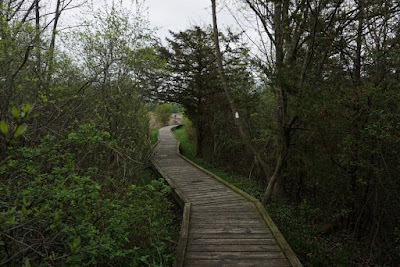 I looked thourgh the Nature Center, and then left it out headed on the rocky area along the river to the boardwalk. 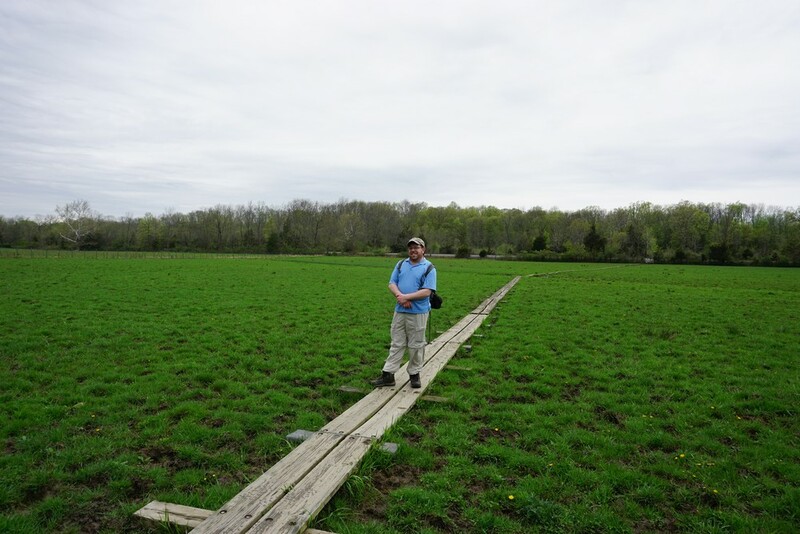 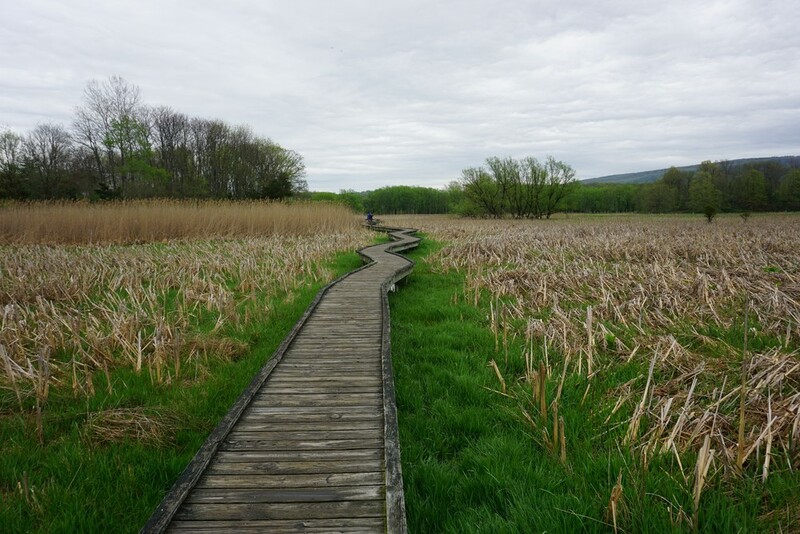 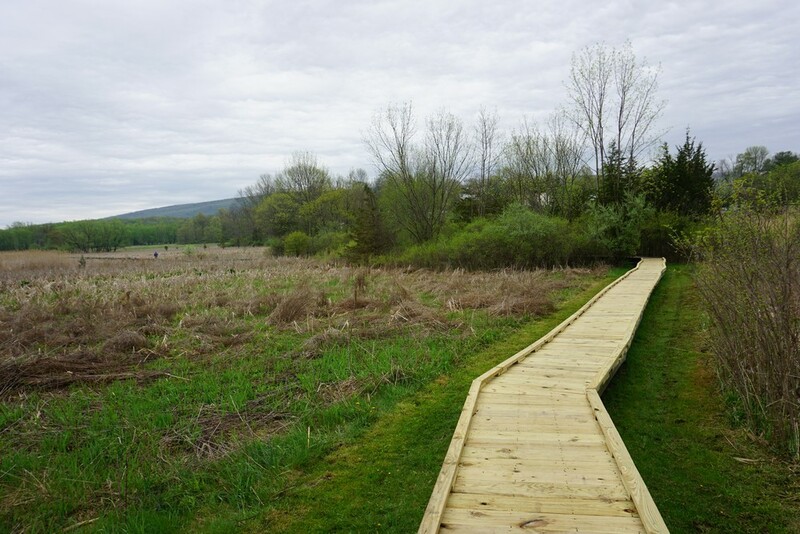 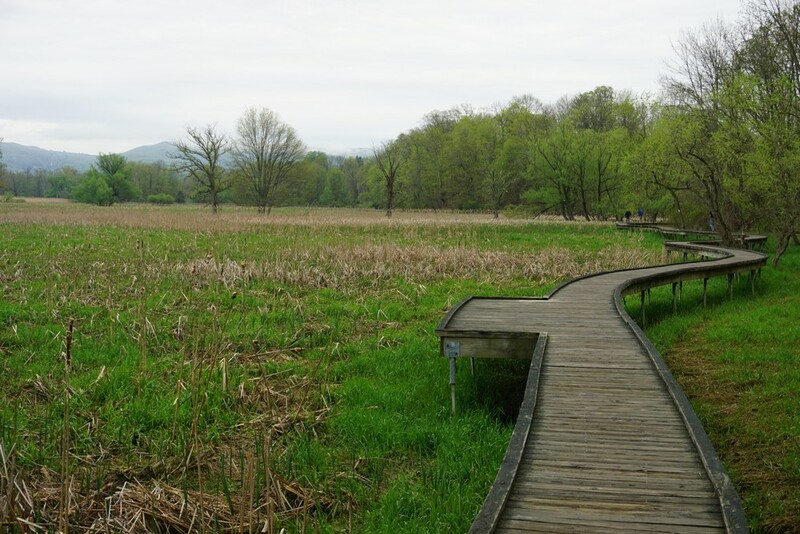 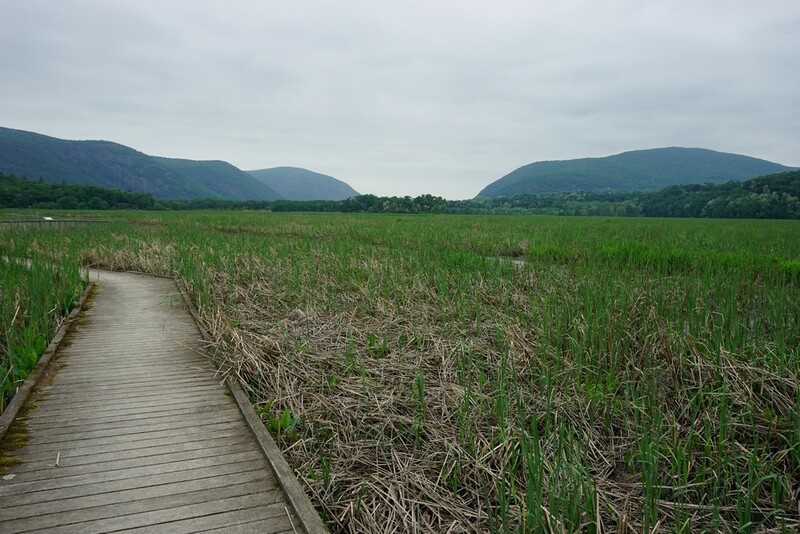 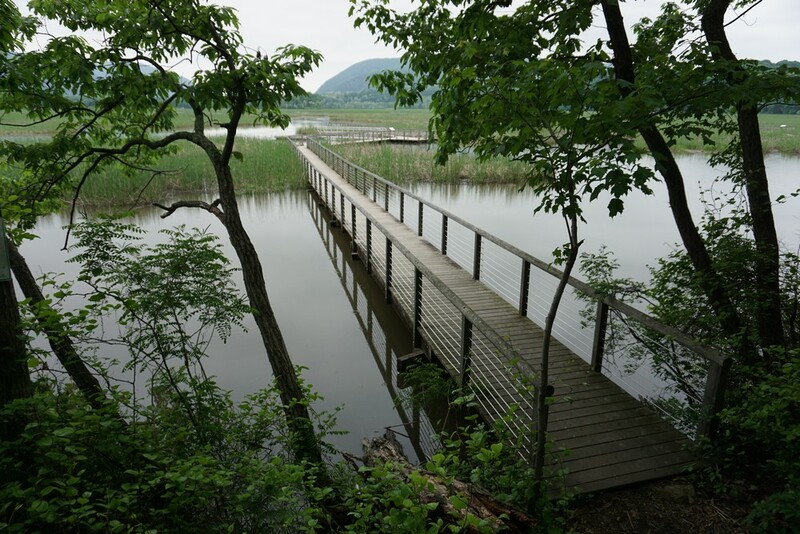 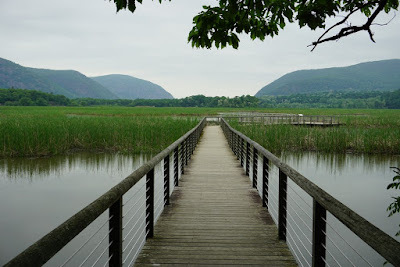 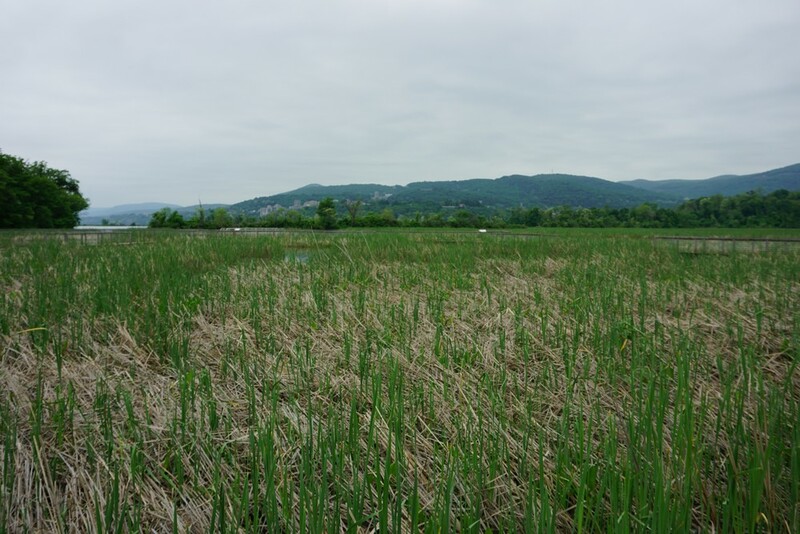 The boardwalk goes over part of Constitution Marsh, a large brackish swampland in the Hudson River. 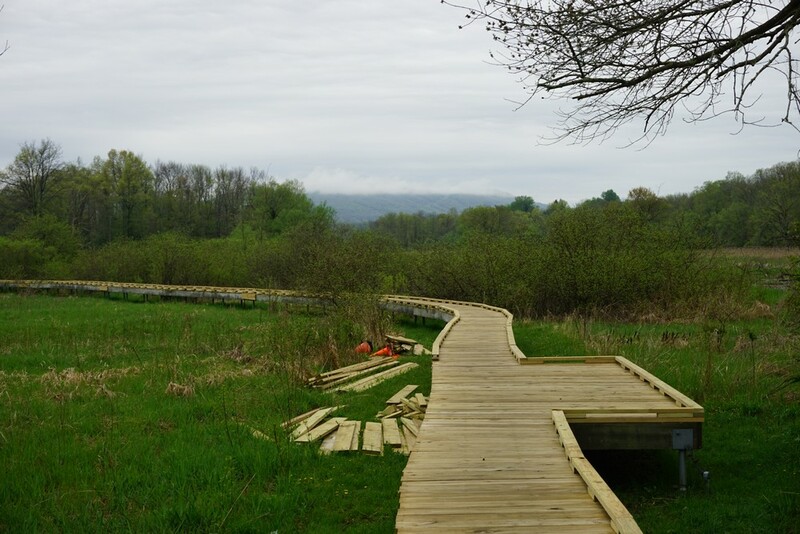 I was quite surprised at the lenght of the boardwalk, which ended up being much shorter than I had expected. 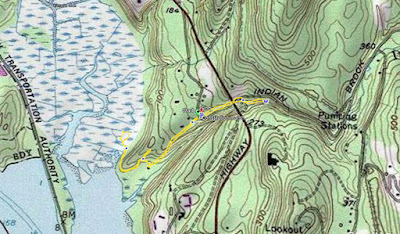 Afer completing the boardwalk and looping aound i took the Blue Trail back to where it intersects the Yellow Trail. 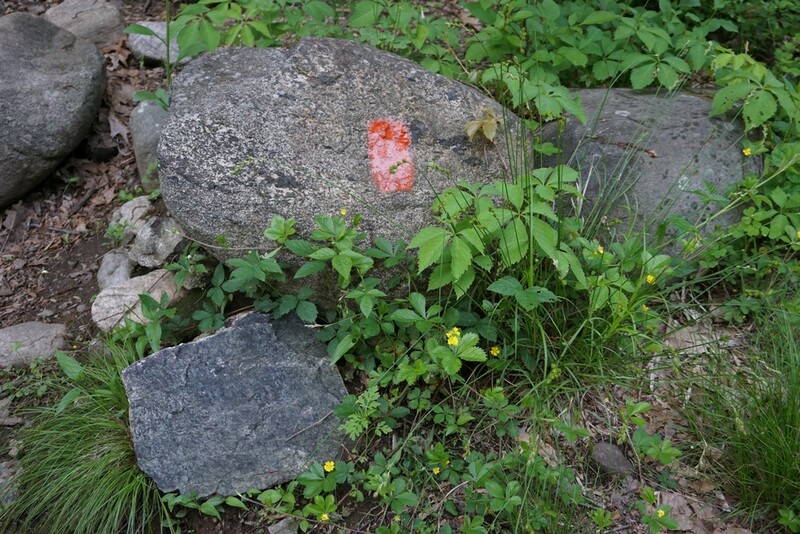 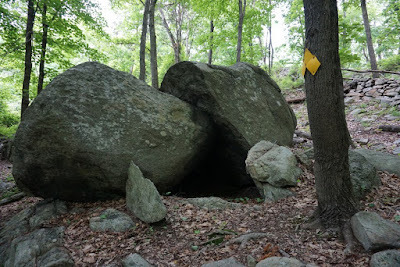 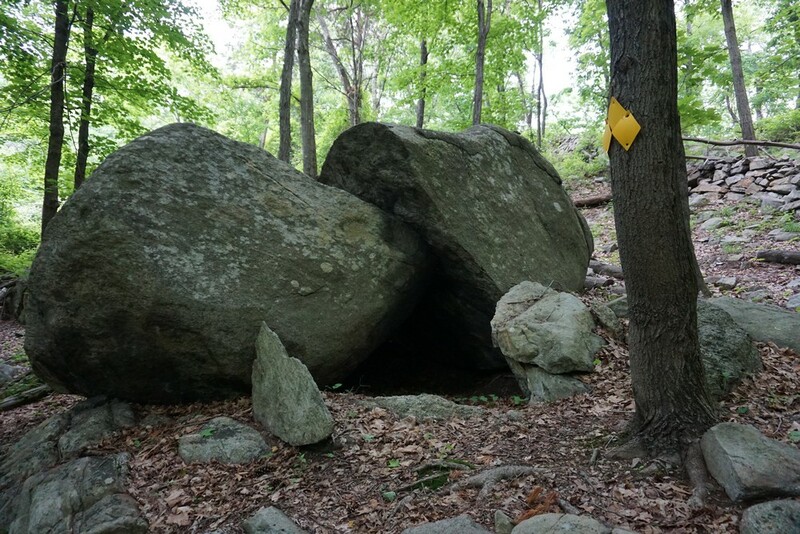 I took the Yellow Trail for the short distance of its doration, which took me to an unintersting split rock. 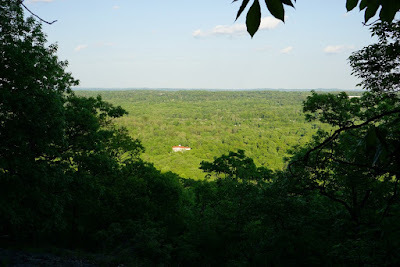 I turned around and went back up the Blue Trail (which also serves as driveway to the Nature Center), which was a bit steep. 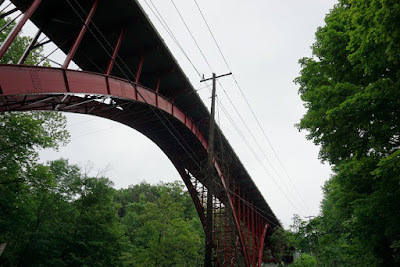 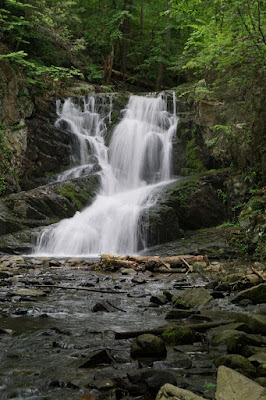 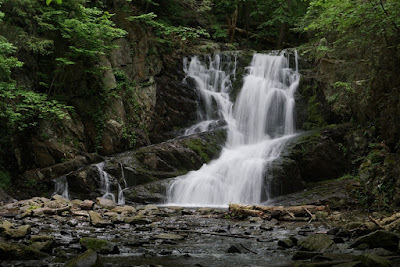 I walked past my car, then under the large bridge with Route 9D above, and then took the Indian Brook Falls Trail to its terminus at Indian Brook Falls. 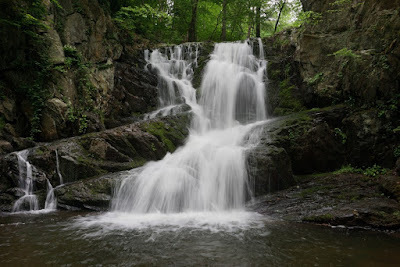 This is an impressive waterfall fall for the region, and the recent heavy rains certainly helped me formulate my impression. 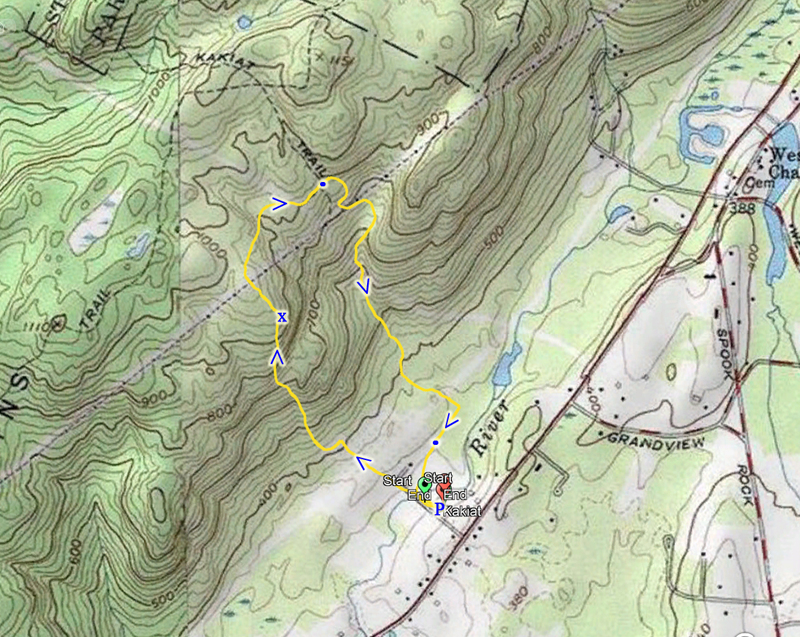 I then turned around, and took the same trail back to my car. Constitution Marsh Audubon Center & Sanctuary. Note Sign for Parking for 8 Cars Only. 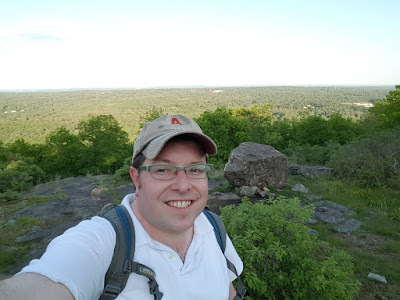 I had not had a chance to go hiking over thr weekend, so I left work early on this weekday evening for a short hike up Kakiat, to the upper summit. 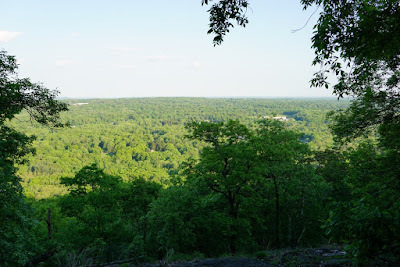 It was still too early for the sunset, but it was already full shade and cooler on this warm day. 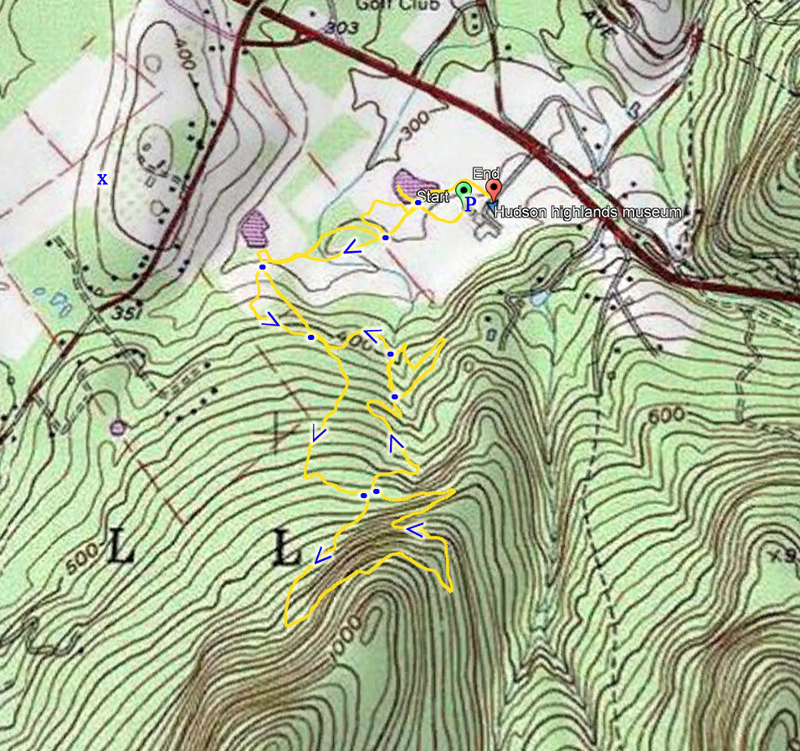 I parked at the main Kakiat parking area, and took the Mountain Trail up the steep ascent to the summit view. 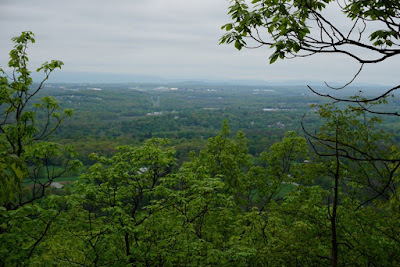 After the view, I continued along the Mountain Trail past the power line, to the Kakiat Trail. 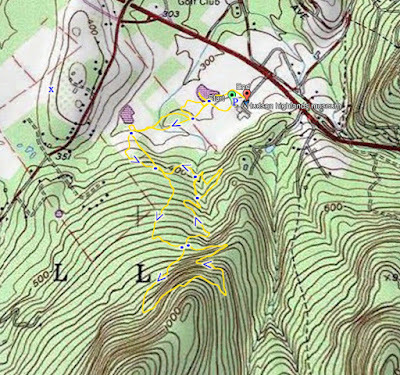 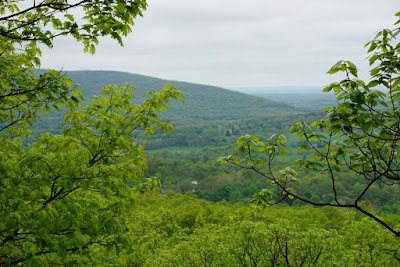 I climbed down the mountain on the Kakiat Trail, passed the gas line at the bottom, and then took the spur to the Old Mill Trail for a short distance to the end of the trail, and then back to my car. 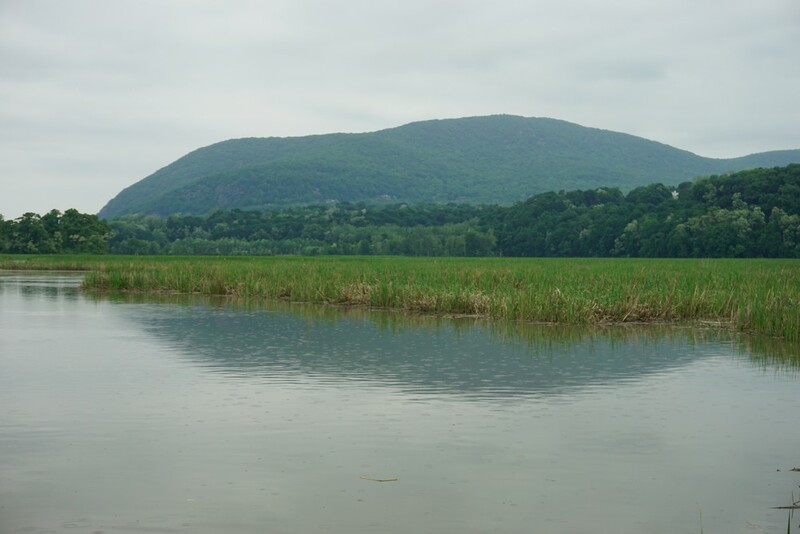 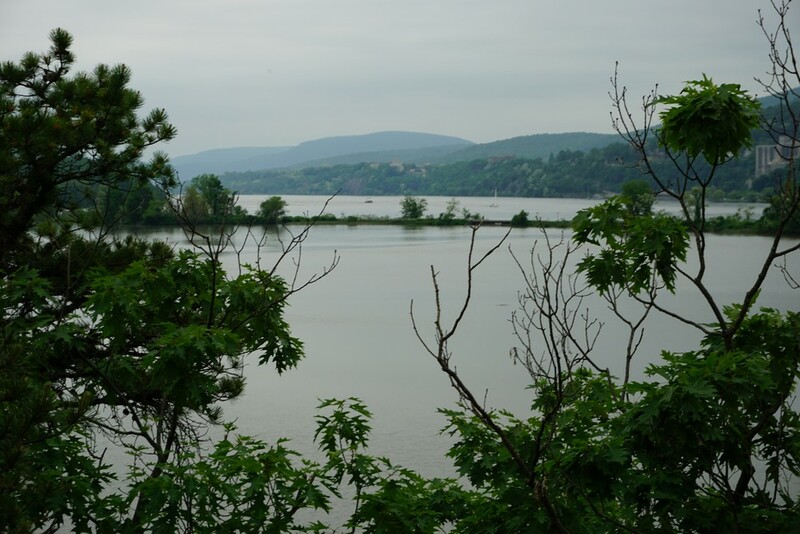 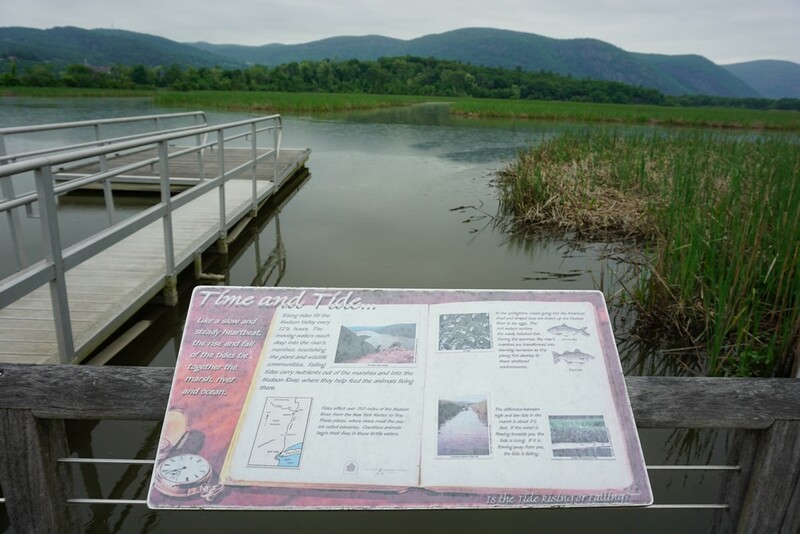 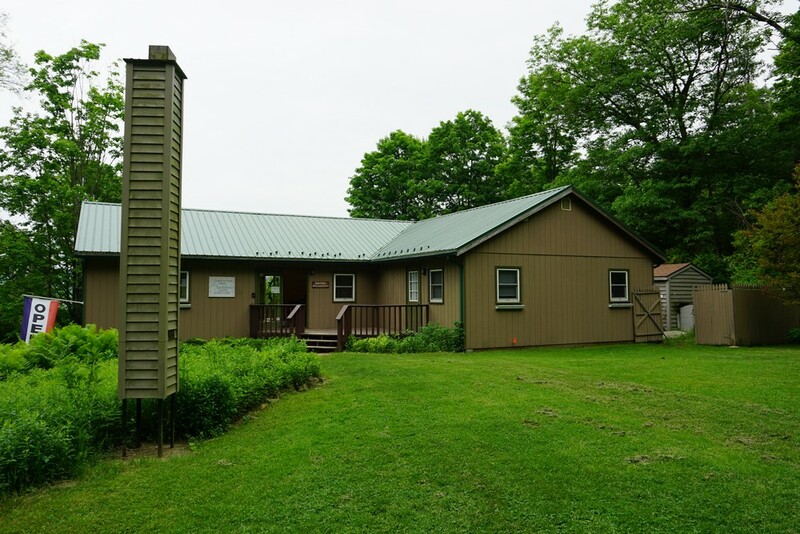 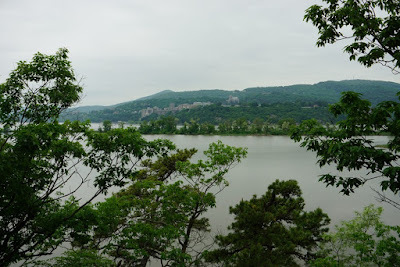 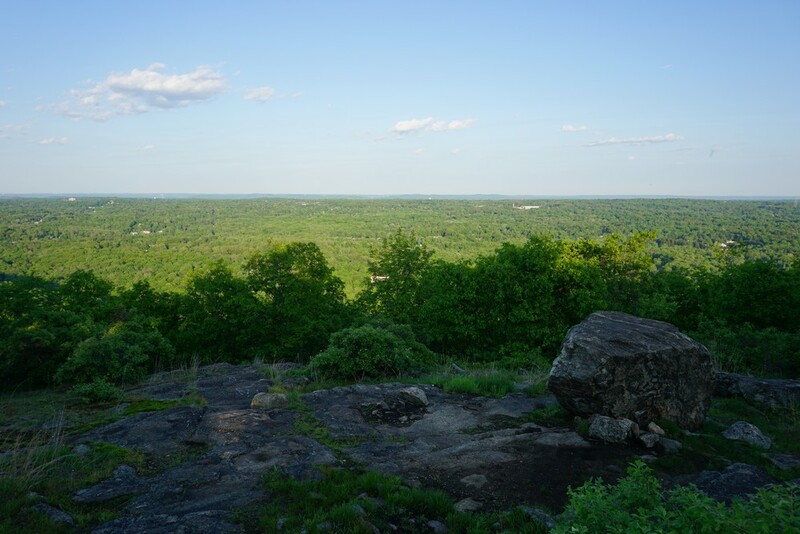 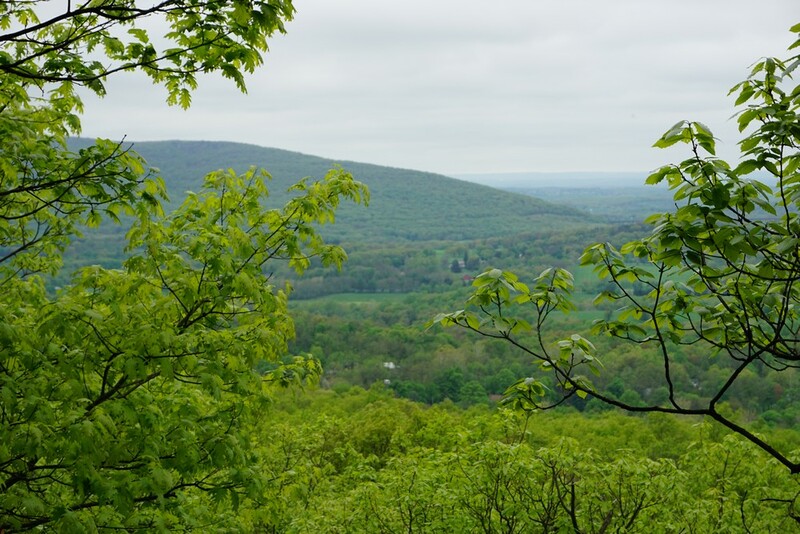 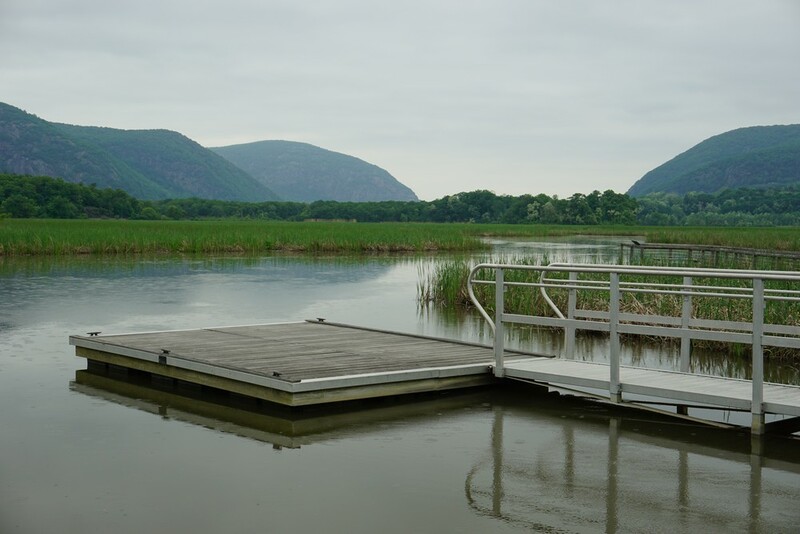 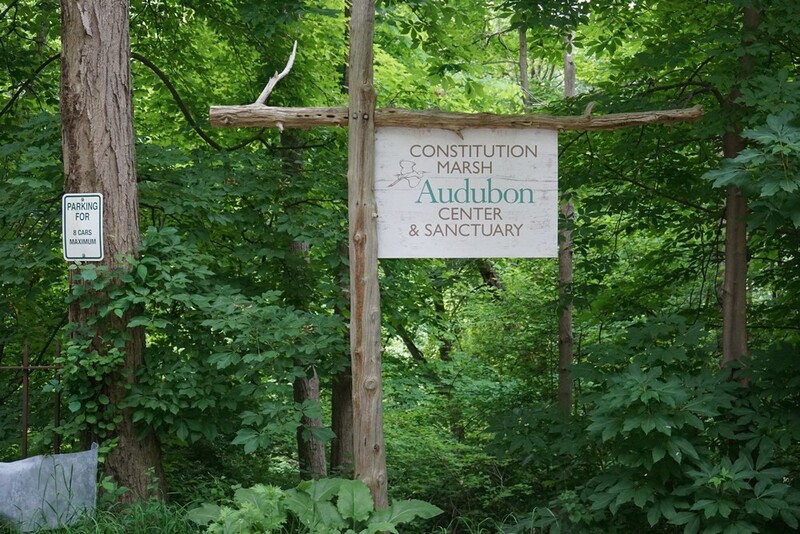 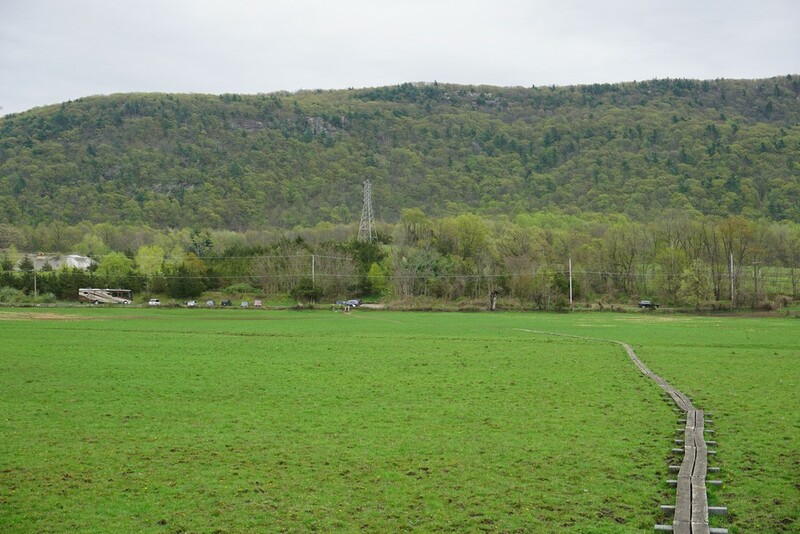 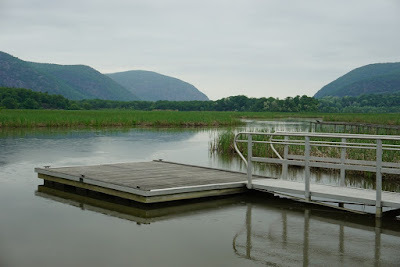 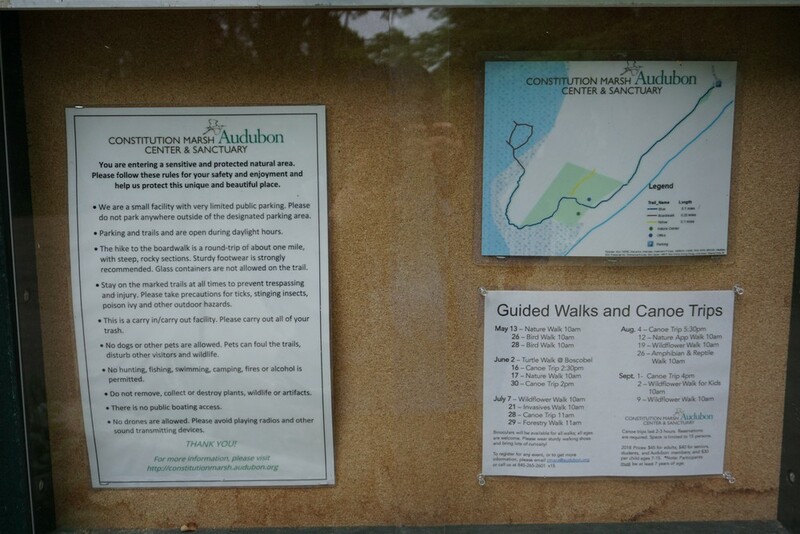 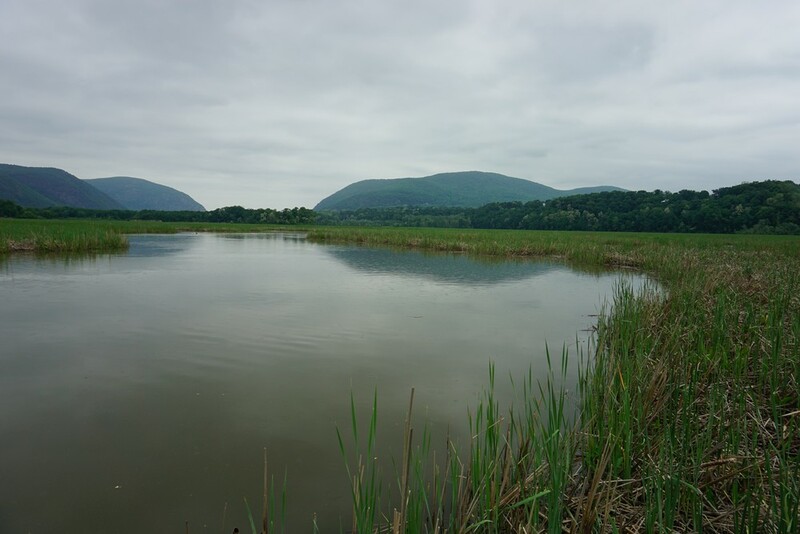 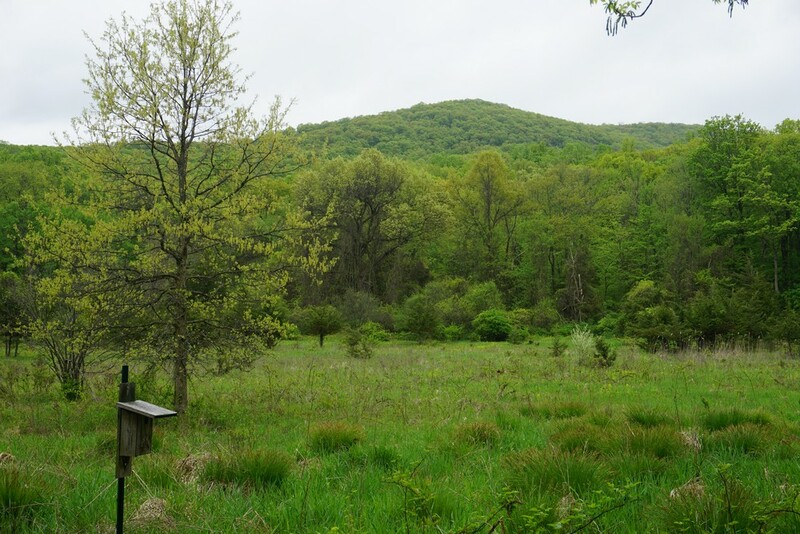 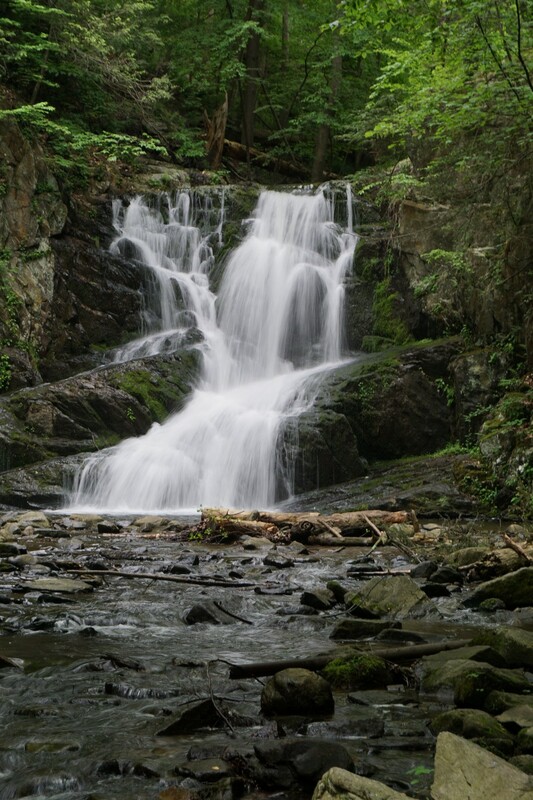 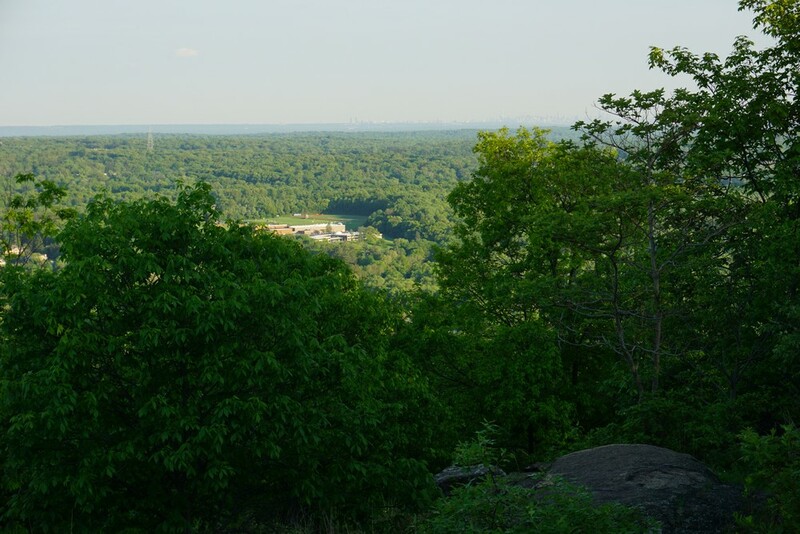 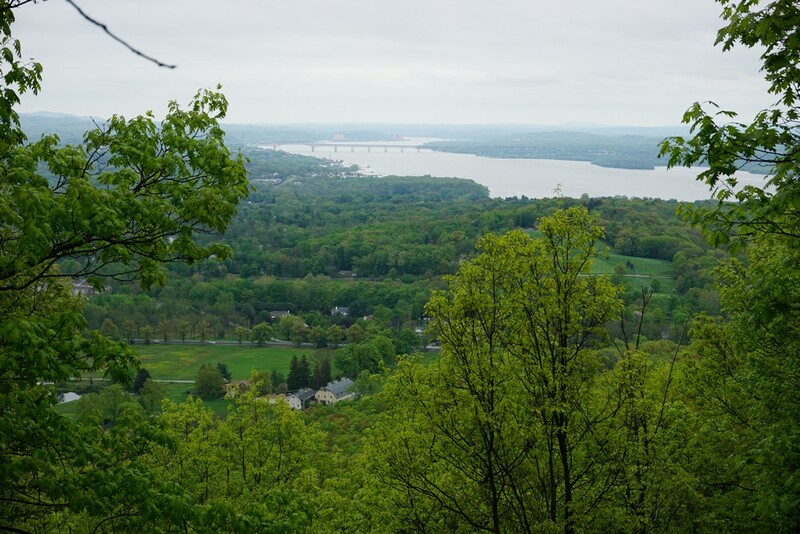 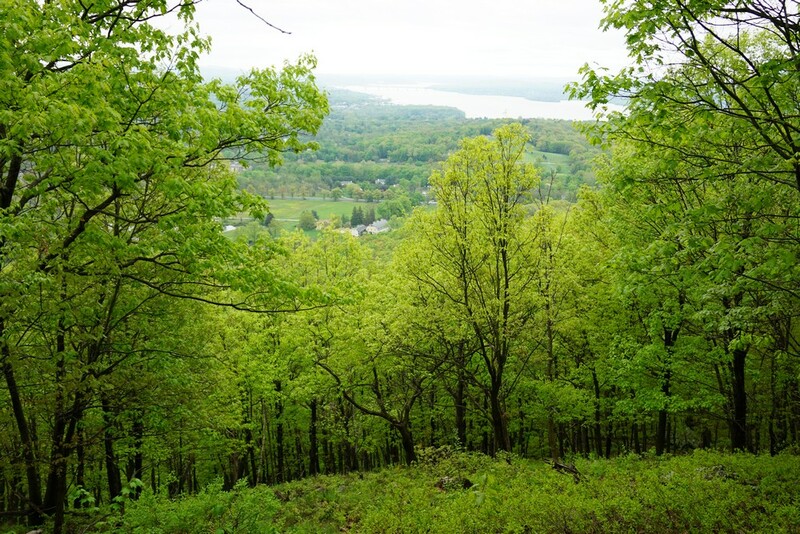 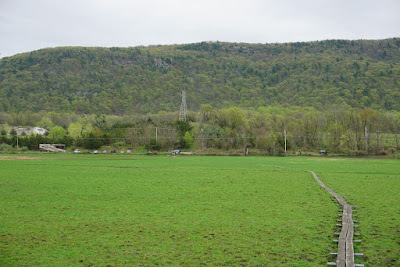 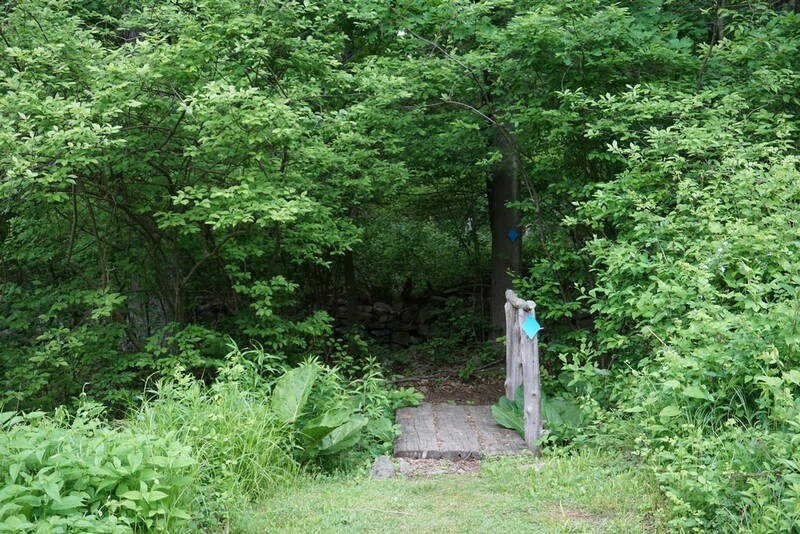 The Hudson Highlands Nature Center is located near Storm King State Park and Black Rock Forest. 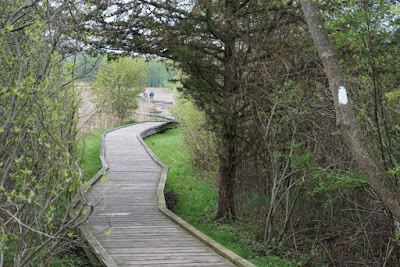 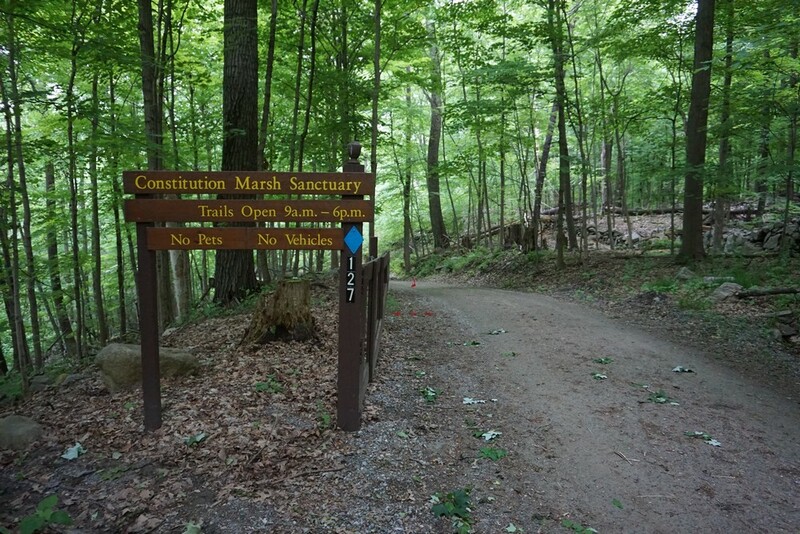 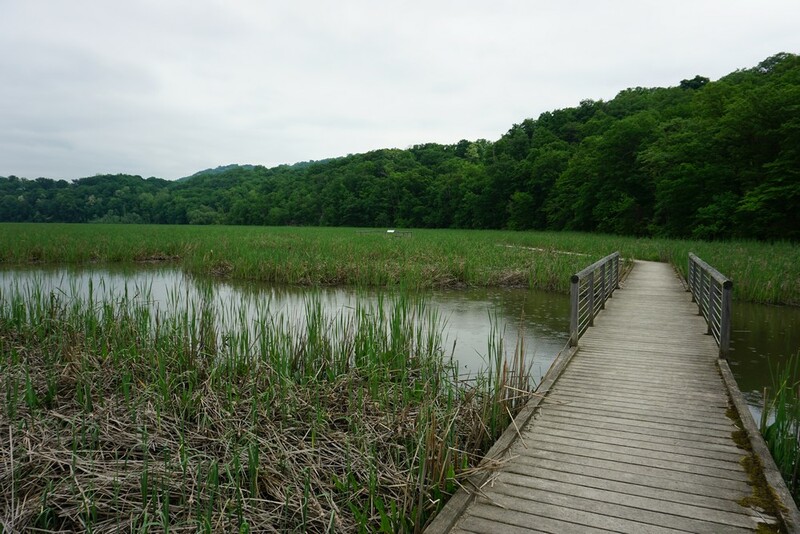 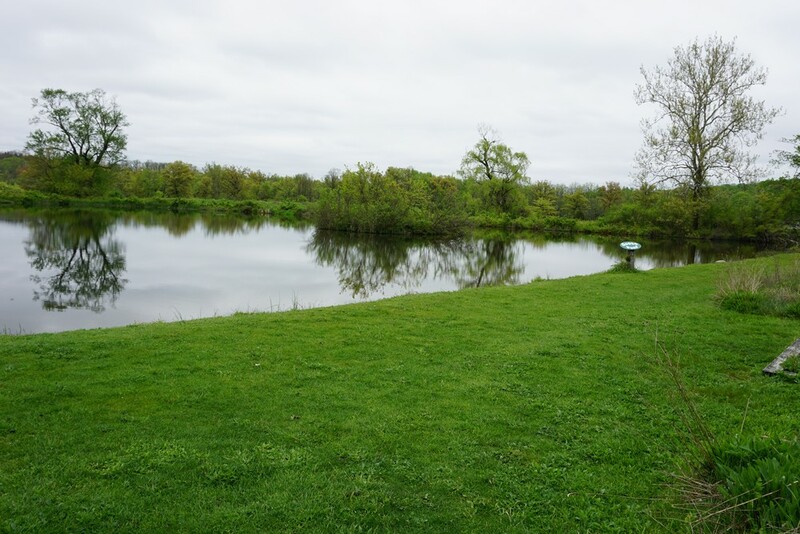 It contains many trails, a childrens nature discovery area, and signs along the lakes. 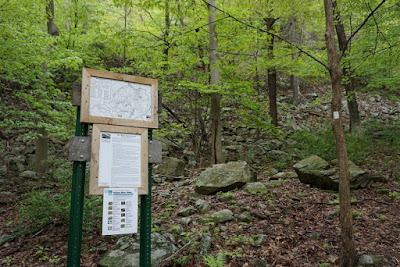 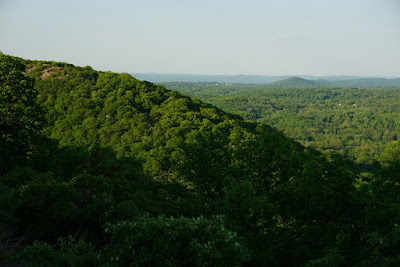 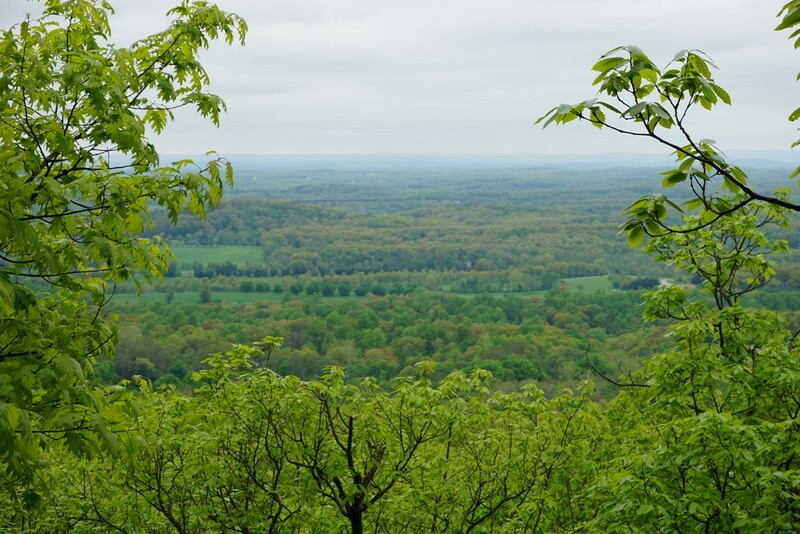 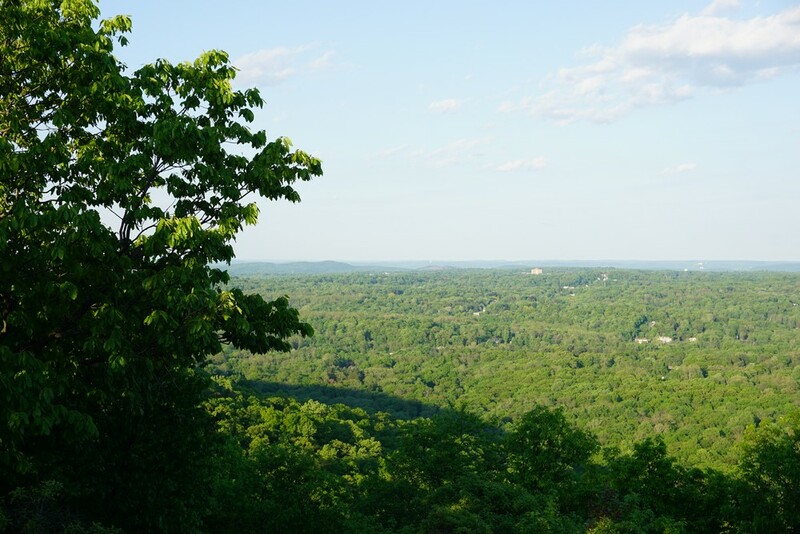 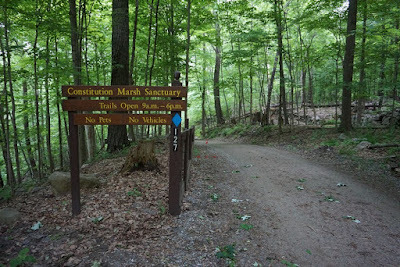 It has a newly blazed trail that climbs up the mountain and affords views, and another new trail connecting to Black Rock Forest. 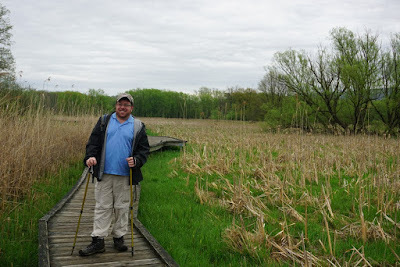 The weather was damp, but it was not actively raining until the end of the hike. 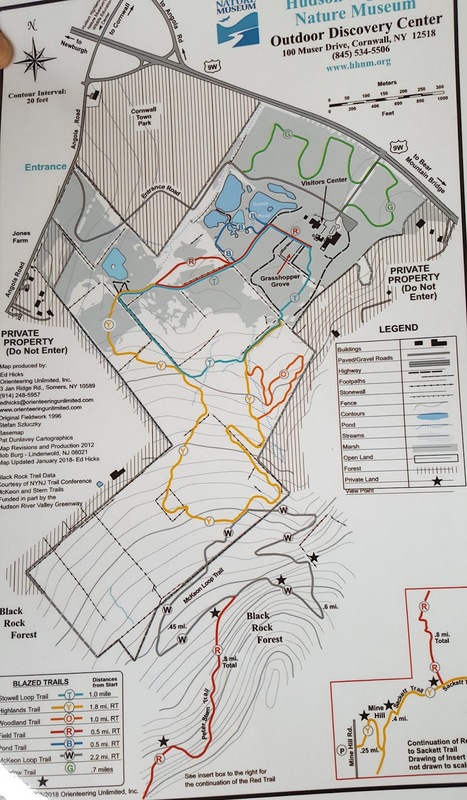 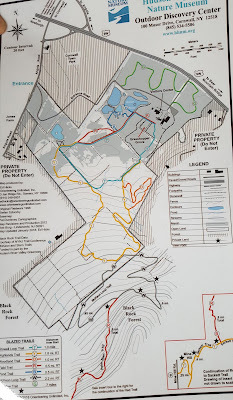 I nearly did all the trails in the area, except for a small part of the Teal Trail that I was unable to complete due to the rain combined with time constraints. 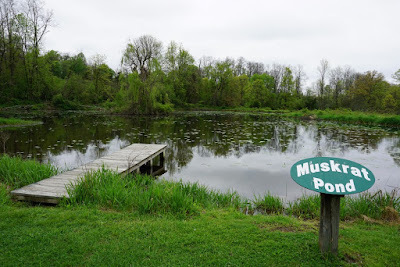 I parked in the parking area off Muser Road, which is right near Route 9W. I took the Pond Trail to the lookout over Goose Pond, and then along the other part of the pond trail. 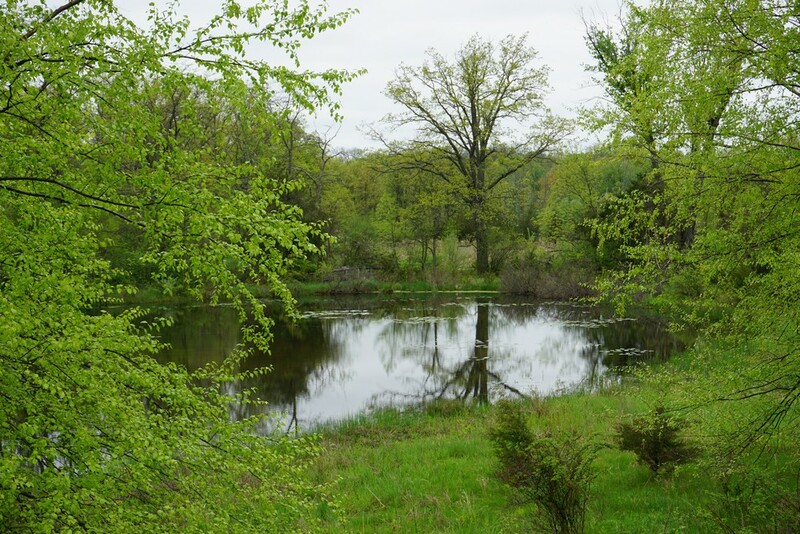 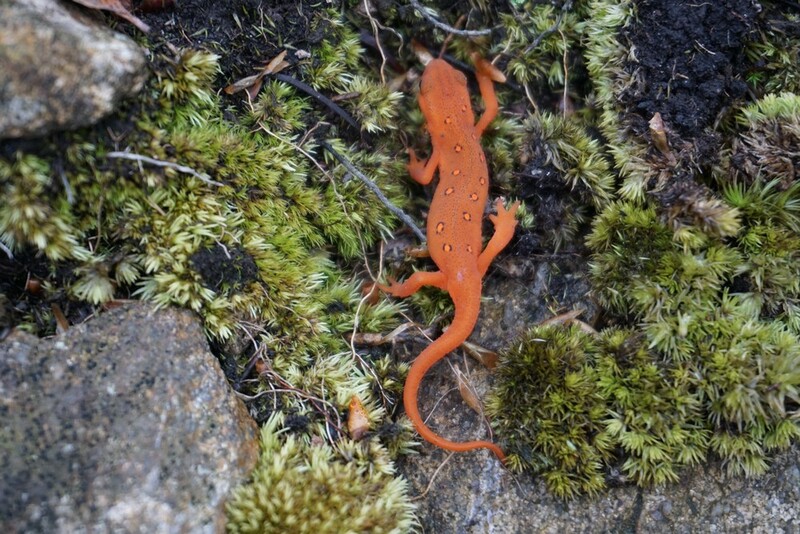 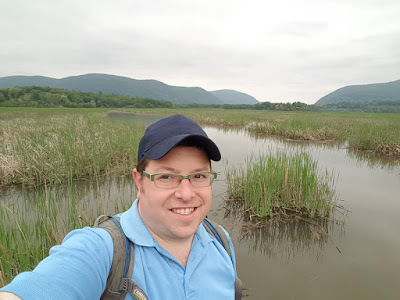 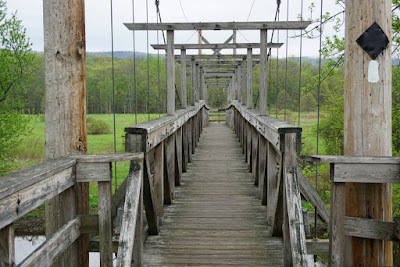 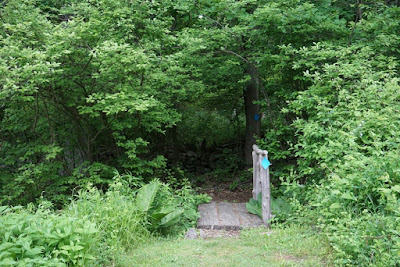 I then took the combined Stowell Loop and Field trail to Muskrat Pond, then continued on the Highlands Trail as it climbed uphill, to the McKesson Loop Trail. 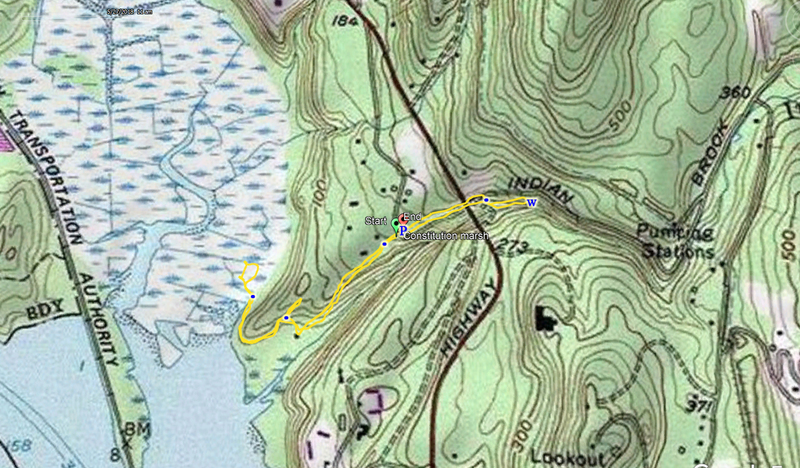 I took the McKesson Loop to its terminus where I first went on the trail, and passed several views along rh way. The views are somewhat obscured by large trees. I continued along the Highlands Trail back down, to the Woodland Trail in its entirety back to the Highlands Trail, and then took the Stowell Loop Trail back, along the stone wall and back to the Muskrat Pond. I then took the other let of the Field Trail back down towards Goose Pond, and then back to the visitors center parking area. 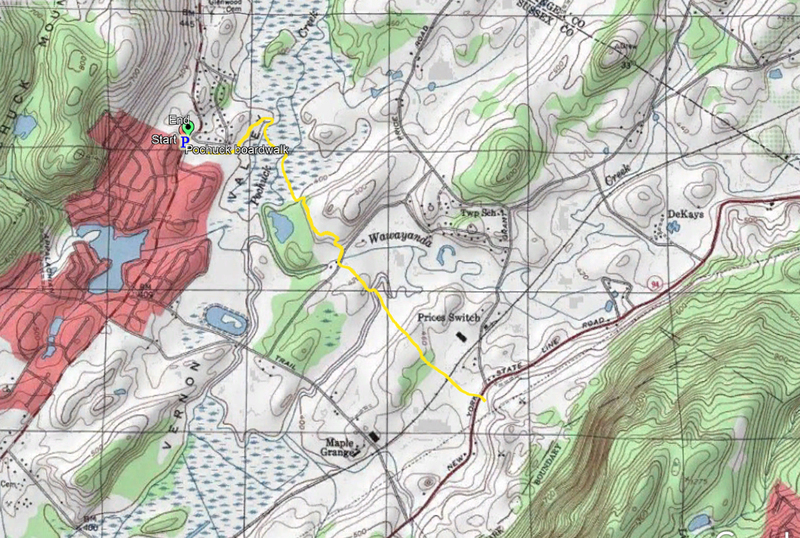 This an interesting hike quite different from the others I typically do. Instead of hiking through forests and vistas, this one is through a swamp on a wooden boardwalk. 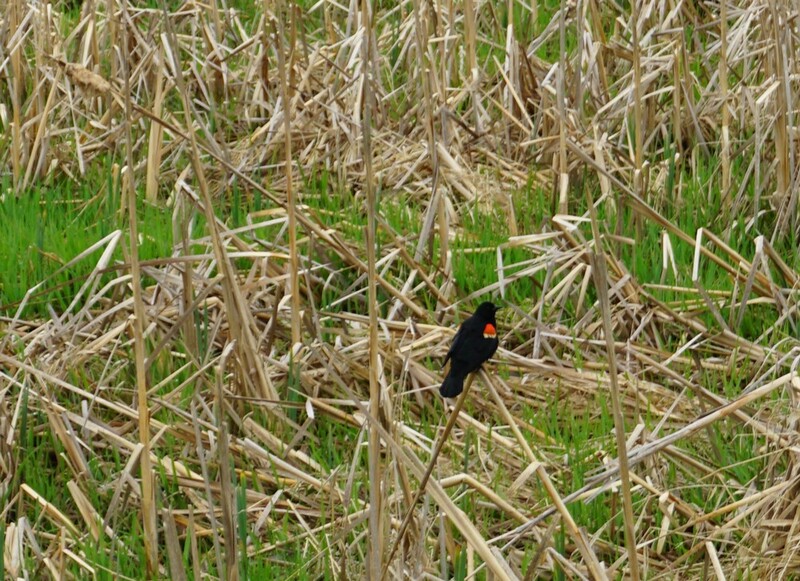 Its fairly easy and has lots of birds, and views of the mountains in the distance. 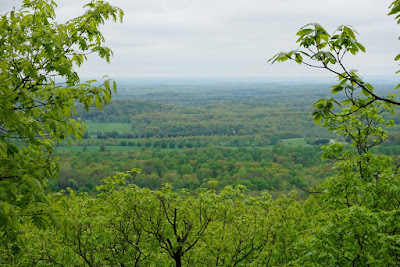 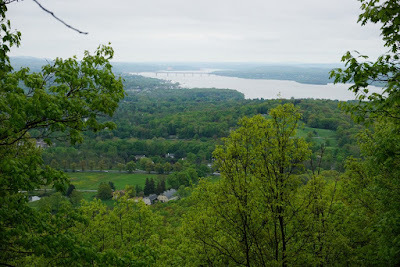 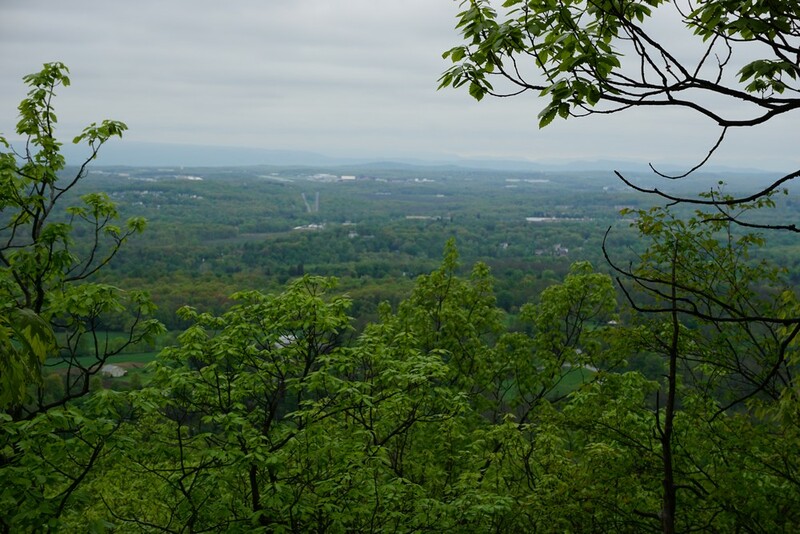 I first noticed this section while hiking the Pinwheel Vista/Stairway to Heaven on the Appalachian Trail at Wawayanda State Park several years earlier. 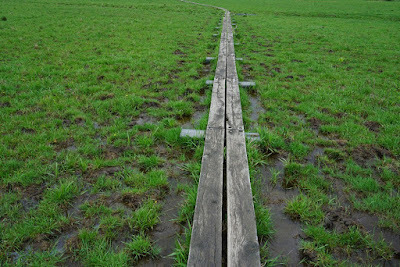 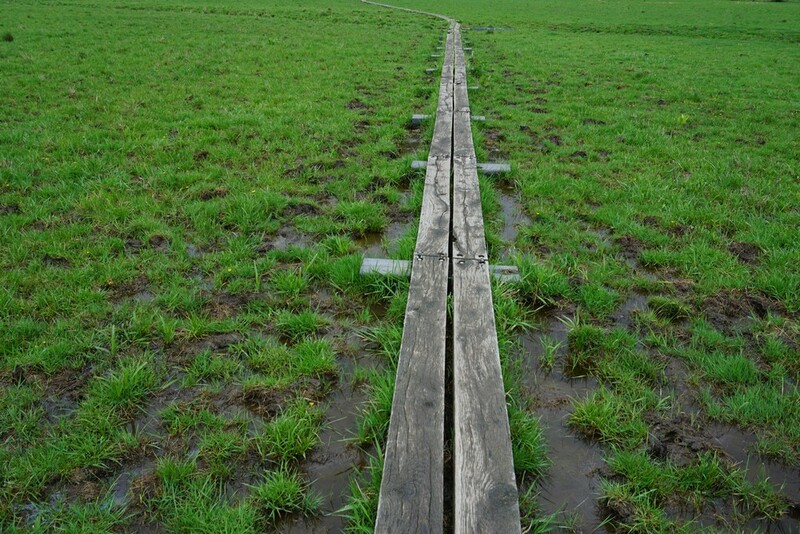 I noticed the wooden planks of the trail below from the summit and thought they would be interesting. 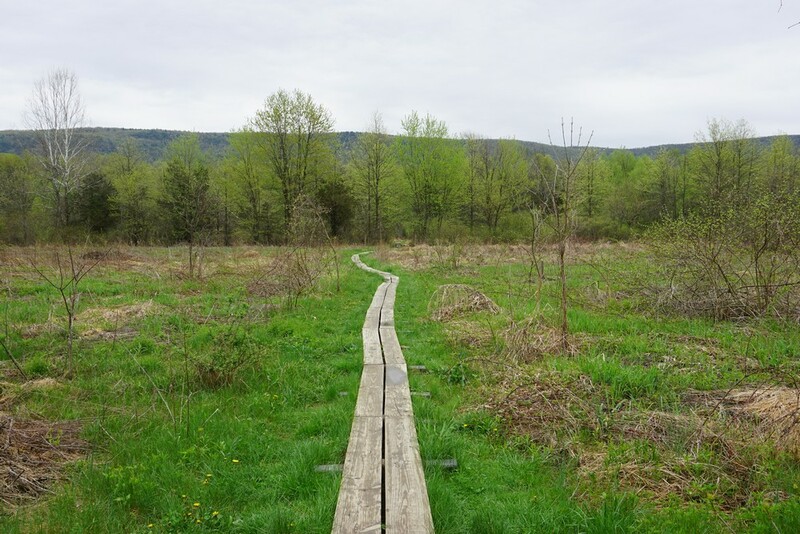 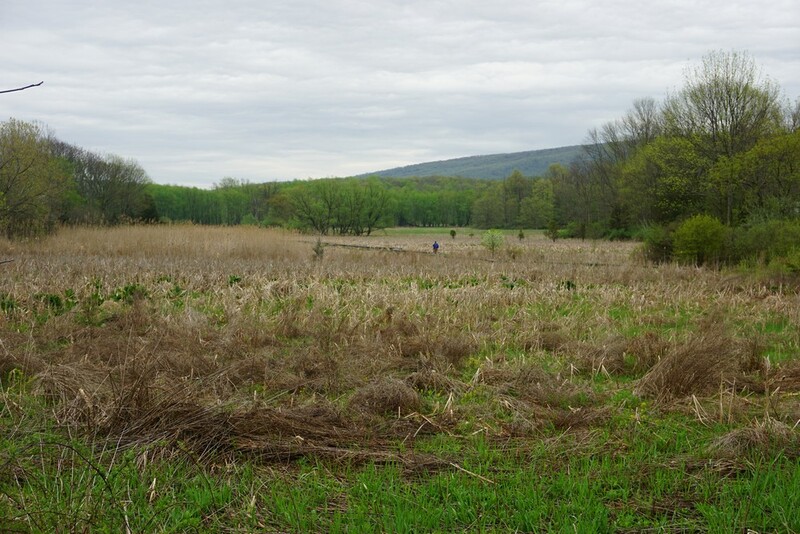 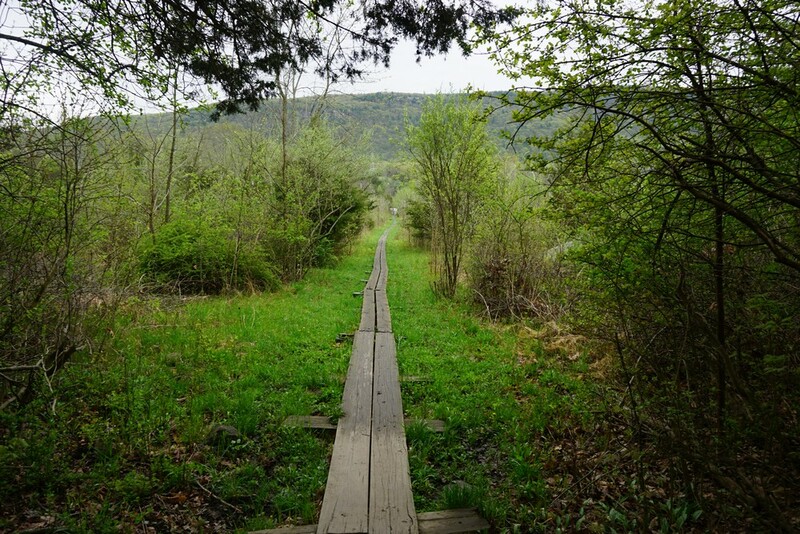 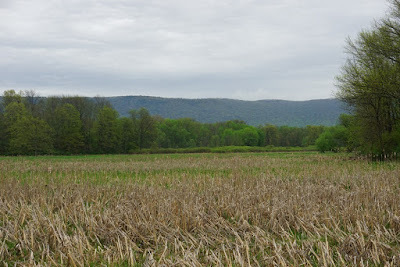 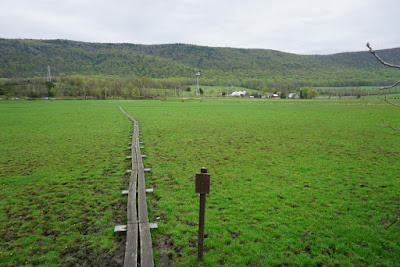 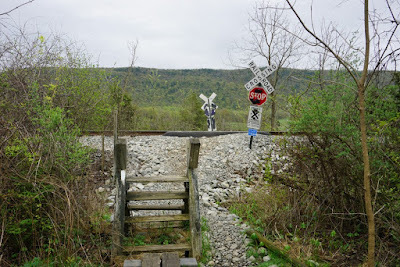 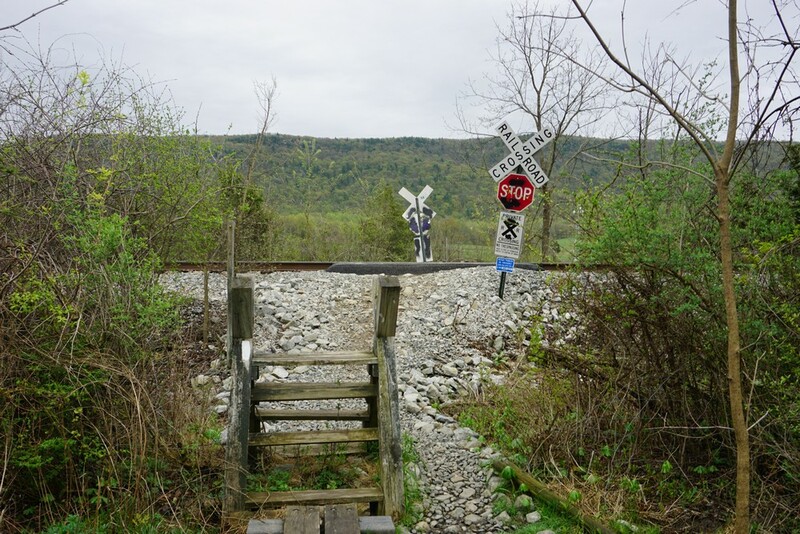 Later on I did some reasearch and learned this is indeed a popular trail area, where the Appalachain Trail is forced to cross a wetlands valley between Wawayanda and Pochuck Mountains. I parked on the side of the road on County Route 517, after Meadowlands Drive, where the boardwalk starts on its western side. 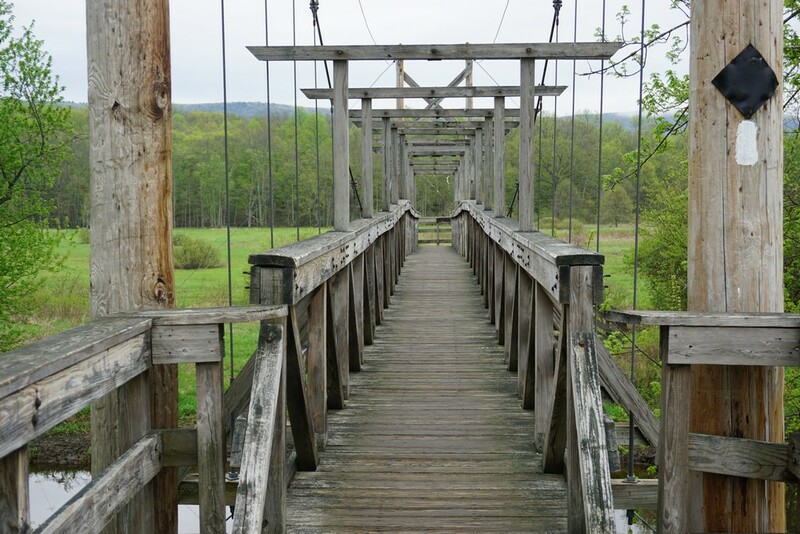 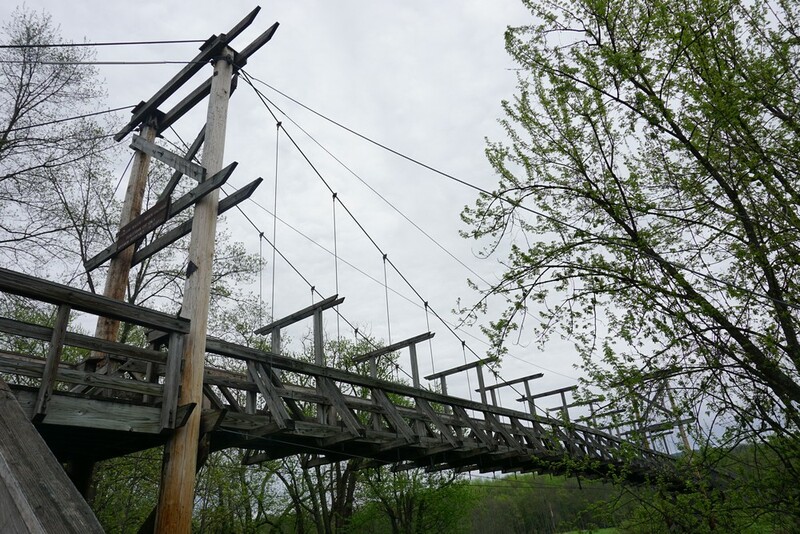 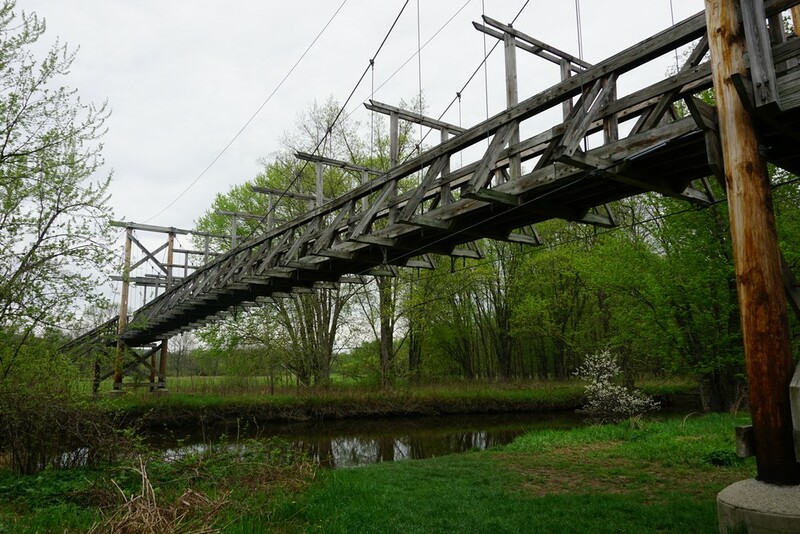 I crossed the wooden suspension bridge at Pochuck Creek, and continued until the trail went into woods on slightly higher elevation. I continued past Canal Road, and on off off the smaller wooden plank boardwalks. 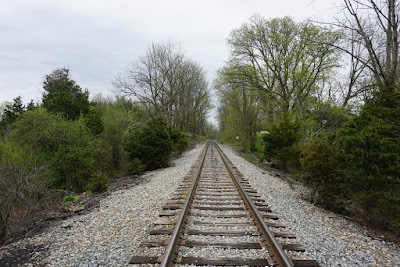 I continued past the railroad, across the field, and then hit Route 94. 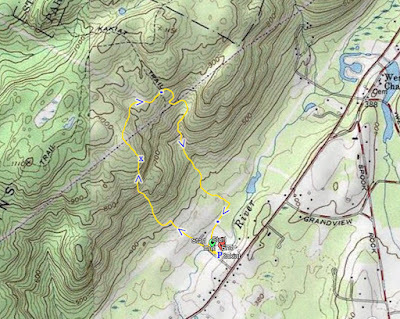 I went a bit in to the Pinewheel Vista trailhead, and then turned around and went back the same way I came.